An A-list of hotspots in San Joaquin Countys burgeoning nightlife hub. Stockton’s vibrant bar scene is where local pubs and tasty grub abound. With Stockton Beer Week still a few months out, here's an A-list of hotspots in San Joaquin County’s burgeoning nightlife hub—just 90 minutes east of San Francisco—to help quench your thirst (and appetite) until July. The Abbey is a local favorite thanks to its prime location and supersized selection of craft beers. In the heart of the historic Miracle Mile shopping district, The Abbey offers a world-class roster of beers and classic bar bites. Choose to pair a new or favorite brew with the famous Abbey Burger, traditional fish-and-chips, Belgian-style fries (with a legendary assortment of signature dipping sauces), or a delicious sampler of locally produced sausage. Finnegan’s is an award-winning local favorite with Irish roots and a wealth of fun activities to go along with that perfect Guinness pour. Patrons can try their luck at karaoke, hit the dance floor, shoot some pool or play a little beer pong to kick things up a notch. The photo booth is another big hit, so be sure to commemorate the night’s festivities by snapping a few pics with some friends. Market Tavern is a premier restaurant in Stockton’s Lincoln Center for foodies looking for an upscale dining option, a hearty craft beer selection, and artisan cocktails. On one side you have a full-service restaurant and bar, and on the other, a grab-and-go market stocked with fresh premium meats and produce. The Kitchen prides itself on serving a menu with farm-fresh ingredients, from its wood-oven pizzas and all-natural pork chops to its signature meatballs. The Tavern offers imported beers on tap and a modern take on classic cocktails using in-house infused liquor. 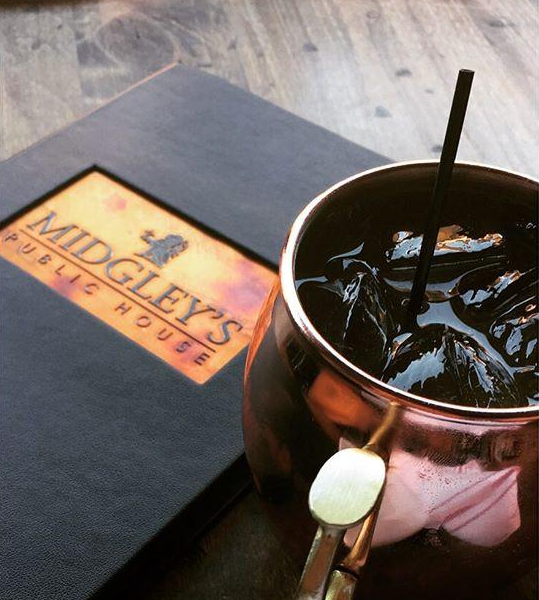 Midgley’s is another one of Stockton’s premier restaurants on the Brickwalk in Lincoln Center. The Top Chef-led eatery caters to a mixed crowd of vegetarians and carnivores. Chef Michael Midgley pairs American-fusion small plates with fine spirits and wine. The broad menu features everything from a lobster corn dog and asparagus cigars to a Tomahawk steak and a whole pig that feeds up to 10 people. Valley Brew is not your average brewhouse. In fact, it’s more than just beers, bottles and TVs, it’s one of Stockton’s premier live entertainment spots. Every Thursday, the brewery hosts famous and upcoming jazz musicians, as well as ongoing jam sessions and other live music. And in addition to serving some of the best names in craft beer, Valley Brew will host your party or banquet for up to 100 people for every imaginable occasion—you name it. Whisky Barrel Tavern is Stockton’s neighborhood saloon right off the Miracle Mile. In addition to cold beer, small-batch whisky and a catalog of cocktails, the Old West-themed restaurant serves a Southern-style menu for breakfast, lunch, and dinner. The Bacon Bouquet—regular, jalapeno, and candied bacon strips—is to die for, while the made-to-order chicken pot pie and slow braised beef are popular among the locals. Enjoy live entertainment or try your hand at some shuffleboard. Hungry for more? Check out our extensive listing of options for dining in Stockton.